Image taken from flight over Kabul, Afghanistan. Photo Credit: Benjamin S. Mack/GALO Magazine. There’s a certain terrifying thrill when landing at Hamid Karzai International Airport on the outskirts of the Afghan capital of Kabul, even if it’s just for a stopover on the way to someplace else. Maybe it’s because the airport is, after all, in Afghanistan — the home of Al Qaeda, the Taliban, the Haqqani network, and numerous other terrorist organizations at war with the West. With such security concerns that make news headlines daily and are a frequent plot point in movies and TV shows such as Homeland, the place is about as far culturally from the leafy streets and cozy coffee shops of Portland or Seattle as one can get. Yet, here I was. I was supposed to be meeting my close friend Kesi — who was also my former flatmate in Berlin before moving back to Toronto for work — in India, but instead I was in Kabul. It was by design that I found myself in the Afghan capital, where dozens of people had been killed in terrorist incidents in 2014 alone. Some would have thought that I — an American who stuck out like a sore thumb most anywhere and a journalist at that — was making a monumental mistake by heading to deeply conservative Afghanistan, a country where women are often viewed as second-class citizens (Afghanistan ranked 147th globally in gender inequality in 2012 out of 148 nations, and the female literacy stands at about 15 percent) and non-Muslims face routine discrimination, to say nothing of the fact that homosexuality can be punished by the death penalty. But anyone who knows me is aware that I’m possessed by an insatiable curiosity to see the world, risks be damned. Previously, that curiosity had led me to such far-flung locales as Kyrgyzstan, Georgia, Zimbabwe, Oman, and even to North Korea twice. Though there had been a few close calls, I was yet to meet an early demise. Afghanistan, however, is not a country to be trifled with. On December 11, barely two weeks before my December 27 visit, at least six people had been killed in two suicide bombings in Kabul, one of which occurred inside a packed auditorium for the performance of a high school play. 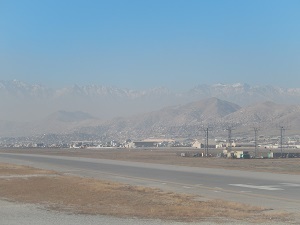 And the airport itself, despite the significant presence of US and NATO-ISAF (International Security Assistance Force) soldiers, was not immune from violence: in September 2009, there was a suicide bombing near the airport entrance, and in June 2013 a shootout with Taliban militants resulted in a number of casualties. As recently as July, Taliban fighters fired two rockets into the airport, destroying four helicopters — one of which belonged to then-Afghan President Hamid Karzai. Landing in the early afternoon after a flight from Dubai (after first beginning my journey in Berlin, with a stopover in the western German city of Düsseldorf), the contrast between the ultramodern United Arab Emirates city synonymous with extravagant opulence and war-ravaged Kabul could not have been starker. “Post-apocalyptic” was the term that immediately came to mind. Kabul’s airport. Photo Credit: Benjamin S. Mack. From the sky, Kabul looks like a large, oversized village of brown mud huts and low buildings no more than two or three stories high. At my vantage point thousands of meters in the air, almost everything I saw was brown in shade — the buildings, the terrain; even the runway had a brownish tinge to it. The cappuccino-esque coloring had me hankering for a cup of coffee. But not everything was the same color as a cinnamon stick. For one, there was the sky, which bore a brilliant soft blue hue reminiscent of water off the coast of a tropical island, or the helmets of the football team of my alma mater (Boise State University). Then there were the mountains — the mighty Hindu Kush, an offshoot of the Himalayas that separates Central Asia from South Asia and is among the tallest mountain ranges in the world. Presently, with the calendar on my watch indicating it was the last days of December, the mountains were speckled and caked with globs of blinding white snow, which looked like vanilla icing atop oddly pointy giant cupcakes. Thud! With a violent shaking worse than any case of automobile-induced whiplash by what seemed to be a factor of 10, the large Airbus plane slammed into the runway. “Allahu Akbar!” (“God is the greatest” in Arabic) someone shouted. Rattling down the runway as we taxied toward the gate of the airport’s main terminal — whose small, square design calls to mind Manas International Airport in Bishkek, Kyrgyzstan or Pyongyang, North Korea’s Sunan International Airport — through the window of my seat near the plane’s right wing I noticed two men in military uniforms sporting AK-47 assault rifles who were seated on rusting metal folding chairs. They sat next to an outhouse-looking structure emblazoned with the words “Afghan Border Police” in slanted yellow writing painted on the side, complete with improper capitalization and squiggly handwriting that made me wonder if it was done by a seven-year-old. It was a marked change from, say, a European airport like Frankfurt or London Heathrow, where things happen with pinpoint precision and facilities are modern. Sitting slightly higher than Denver, Colorado, Kabul may be 5,876 feet (1,791 meters) above sea level, but most physical activity at such lofty elevations does not result in shortness of breath. Still sitting in my seat, I certainly felt no ill effects, despite only having been at high elevation only a few times in my life. 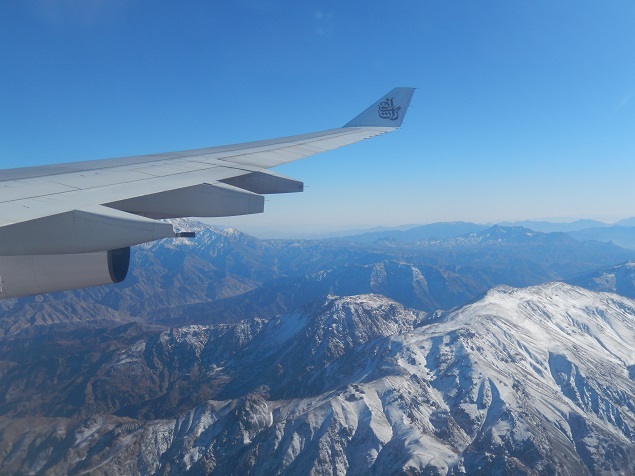 “Is this your first time in Kabul?” asked a smiling flight attendant as I grabbed my backpack, clad in the trademark immaculately tailored beige uniform with a red cap and white scarf that Emirates cabin crew are famous for. “I have never been to this airport before,” she said, still smiling. I didn’t think I’d ever seen Emirates staff with any other facial expression. “Well, it’s certainly different than Dubai,” I remarked. Her candor was brutally honest. Exiting the plane and descending the stairs onto the asphalt tarmac — rebuilt in 2012 with the help of the Japanese government — a biting chill hung in the air. Winter temperatures in Kabul often hover around freezing, and the combination of usually bone-dry air, high elevation and strong winds make it feel much colder. I’d brought only a single lightweight jacket (in anticipation of warm weather in my eventual final destination of Bangalore, located in southern India), meaning I felt about as cold as someone traversing the McMurdo Dry Valleys in Antarctica. At least, I thought morbidly, the weather probably meant it was too chilly for any Taliban attacks. Even if the Taliban were to attack, they would have had to deal with scores of heavily-armed security inside the terminal. Entering the mostly concrete structure, it seemed at every turn a gaggle of armed men stood by with automatic weapons. I would have snapped a photo, but the combination of the intimidating figures and several large signs reading “no photography” in English convinced me otherwise; the rules made me feel like I was in North Korea again, where every move is monitored and photos of anything are only allowed with explicit permission from government-employed guides. The other thing I noticed was that everyone inside the airport — originally built by the Soviets in the 1960s, and used extensively during their failed invasion of Afghanistan in 1979 — was a man. No women, or children, were visible anywhere. The last time I’d seen such an overabundance of testosterone was…actually, I’d never seen such skewed gender dynamics in one place, even at the Sultan Qaboos Grand Mosque in Muscat, Oman I’d visited the year prior (where women are forbidden from entering the main prayer hall). I felt bad for the flight attendant I’d met on the way, who I thought would no doubt have to suffer countless leering glances and other inappropriate indignities if she stayed long; at present, she was conspicuously absent. Squeezing past the profusion of Y-chromosomes, a combination of cramped quarters and poor ventilation meant the whole airport stank horribly. The putrid smell assaulted the olfactory senses like a blindside tackle from an NFL linebacker or rugby pro, reeking of rotting potatoes (or other spoiled food, but for unknown reasons I was reminded of potatoes) and human body odor. Pee-ew! With no luggage other than the backpack which I wore, I bypassed baggage claim and immediately proceeded to the security line. A man in a dirty-looking blue uniform sitting behind a scuffed wooden desk examined my passport with an unsmiling expression.